One day I decided to hunt our Waldron Collection for handmade paper dolls by known or professional women artists. 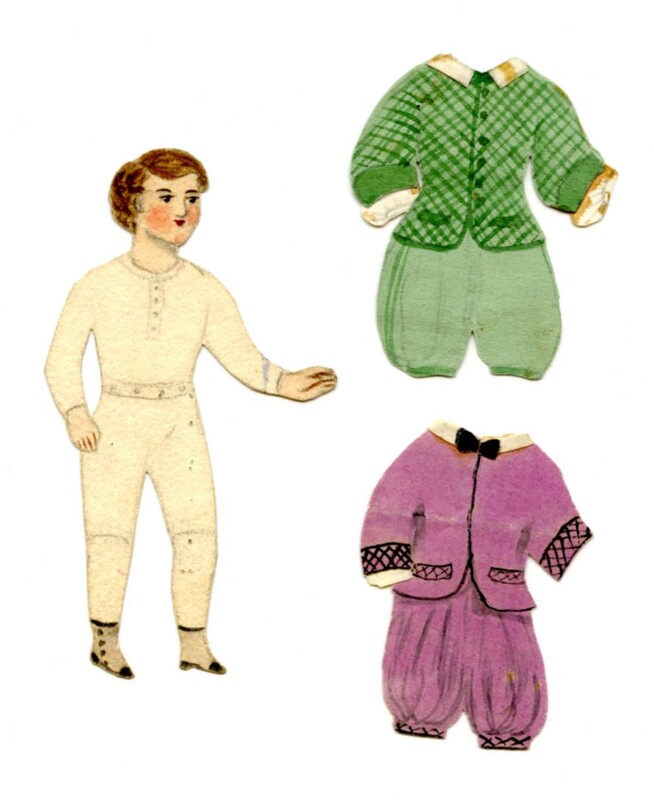 My interest was piqued after using illustrator Frances Brundage’s paper dolls from the 1890s set “Children from Many Lands,” sold by Raphael Tuck & Sons, in a library exhibit, and I hoped to find dolls that artists may have created for their own amusement. 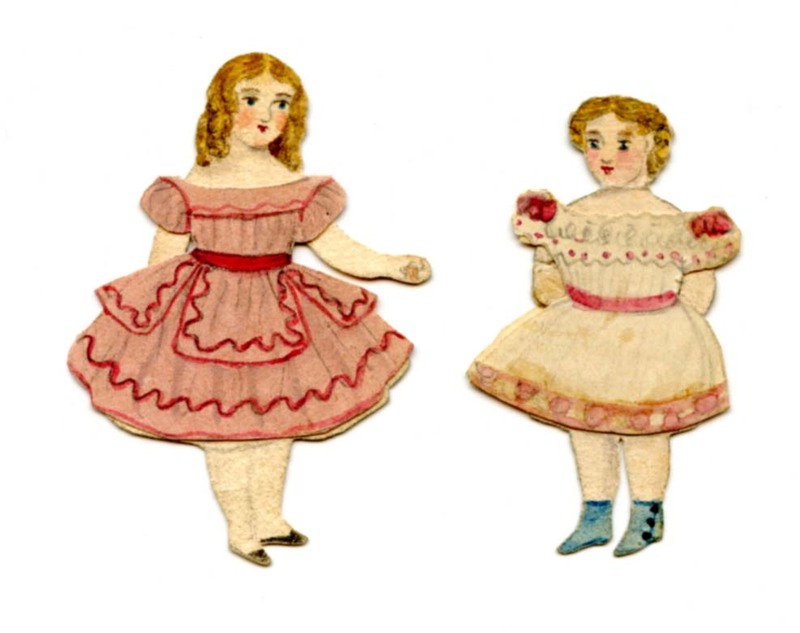 “Little Women” fans know of the paper dolls played with by the Alcott sisters, presumably made by Louisa May Alcott’s younger sister May Alcott, later known for her still life paintings. After all, creating paper dolls is an entertaining way to practice rendering poses, facial expressions, and clothing. Our Waldron Collection database lists dolls made by Sarah Goodridge (1788–1853). What a find, for while not now a household name, miniature painter Goodridge (sometimes Goodrich) was a respected artist sought after by many famous people in the early 1800s. 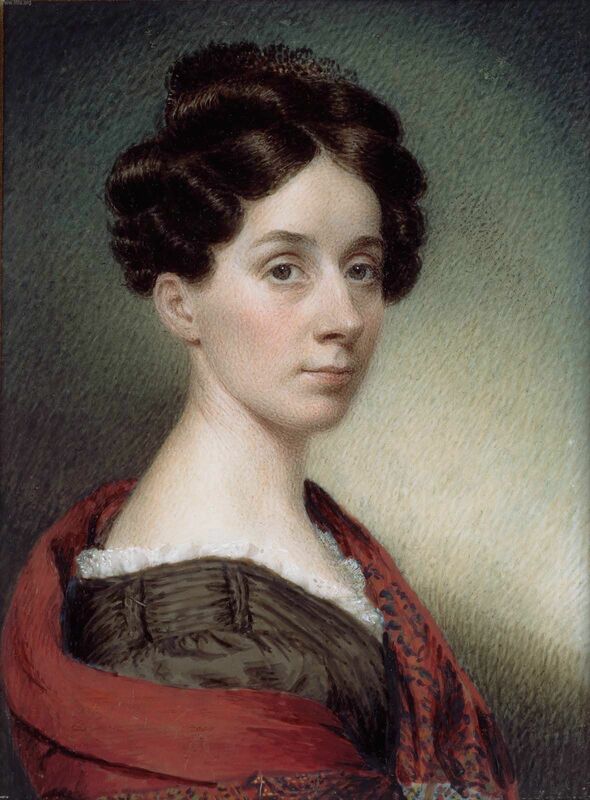 A humble beginning that began with first self-instruction and then evolved to training by an unidentified miniature painter, propelled her to open her own studio in Boston in 1820 and take lessons from Gilbert Stuart, the foremost American portraitist. In several years, she was in regular demand by not only her former teacher Stuart but other notables such as China trader Russell Sturgis, newspaper publisher and author Isaiah Thomas, and Senator Daniel Webster. Upon looking at the several dolls and various outfits attributed to Goodridge with our cataloger Laura Parrish, it was immediately apparent that at least two sets of hands, and maybe a few more, created them because while all the dolls are of a similar size between 2 and 3 inches, the clothing styles date from two different time periods. Mrs. Waldron, the collection’s donor, thankfully kept a 1940 letter by a Goodridge descendant’s husband stating one set was made by Sarah Goodridge, the other by her great niece Martha Harris Appleton Brown (1843–1919). 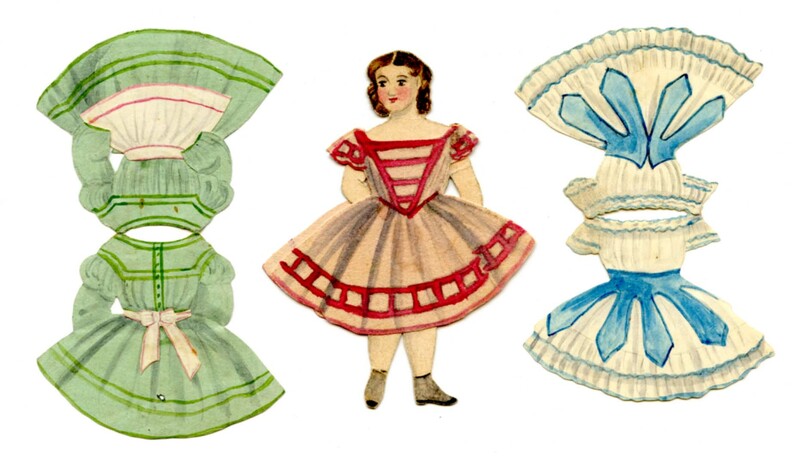 The first set contains one doll with four dresses in the high-waisted, slim silhouette style of the early 1810s, and therefore we can safely say made by Goodridge. The dresses have tags meant to be folded over the doll but don’t show much evidence of being played with as the creases aren’t deep. Goodridge was in her 20s at the time, early in her career, but obviously having advanced manual dexterity to execute them. Never having married, Goodridge lived with various siblings throughout most of her life and helped to support them with her artwork. In 1851 she moved in with her sister Beulah for her last two years. Perhaps she instilled her love of paper dolls in Beulah’s granddaughter Martha and gave instructions on making them. The second set consists of several dolls, four girls, a boy, and a baby, with around 36 costumes. The fashions are from the early 1860s and support the statement that Brown made them. The back of one dress shows the paper was cut from an 1862 published report. Instead of sporting tags like the Goodridge clothing, these costumes were designed showing fronts and backs with slits at the neck to be placed over a doll’s head. Interestingly, most slits aren’t large enough to fit over the dolls’ heads—was this an error in craftsmanship or were these meant to be admired and not played with? While most dolls and clothing appear to be drawn by the same hand, a few don’t display the same level of skill and precision. 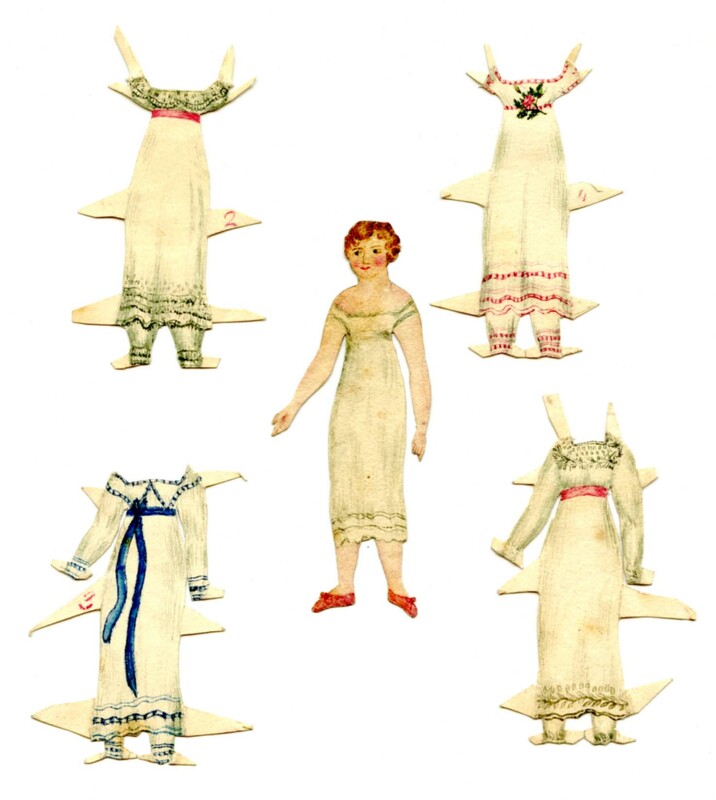 The eldest of seven children, perhaps Martha used paper dolls as an activity with her younger siblings making most, but not all of the examples. While we can never say with utmost certainty who created these dolls, they were lovingly preserved for several generations of the family and now by us for all to admire. 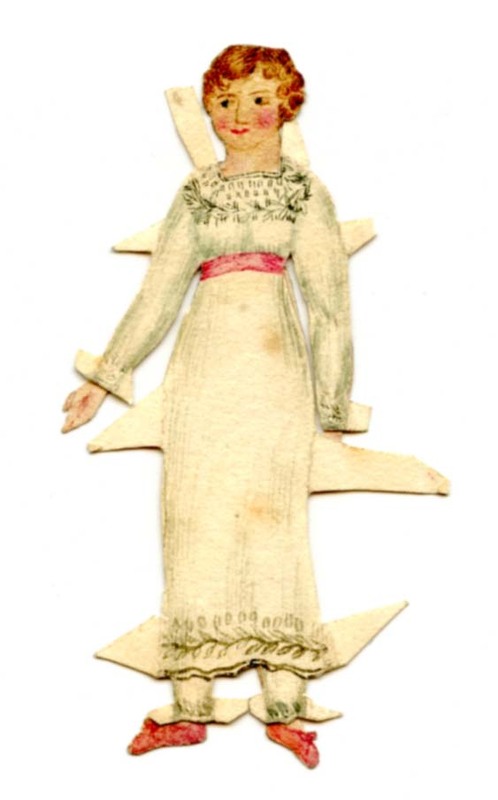 This is the second post in a series about paper dolls housed in the Winterthur Library’s Maxine Waldron Collection of Children’s Books and Paper Toys. This entry was posted in Ephemera, Library, Uncategorized and tagged ephemera, paper dolls, Winterthur Library, Winterthur Museum Garden & Library. Bookmark the permalink.